I’ll be honest: when I was asked to write a review for Maty’s Healthy Products, I wasn’t so sure about it. Even though Stephanie had been reviewing Maty’s on Keeper of the Home for a while, I had never tried them for myself. Even when I received my product, their all natural Acid Indigestion Relief, in the mail, I was a little disappointed because it was a product that I thought I wasn’t likely to ever use. I hardly ever experience heartburn or indigestion so I wasn’t sure how I would be able to accurately or fairly write a review. I’m always trying to get him on my healthy living track, but more often than not, he reaches for what he knows and for heartburn and indigestion that’s usually Prilosec. Sometimes I will convince him to try ginger tea or drink warm lemon water and even raw milk helps, but that takes preparation and he’s not usually that patient! When I offered him the Maty’s syrup and it was ready to use, he didn’t even hesitate: he happily took it right away. Taking the box back from him, I noticed the ingredients were all food-based. *Although not evaluated by the FDA and not intended to diagnose, treat, cure or prevent any diseases, we know how helpful and beneficial real food is! Right on, honey! These are exactly the kinds of real food products that I would treat his symptoms with if given the time. 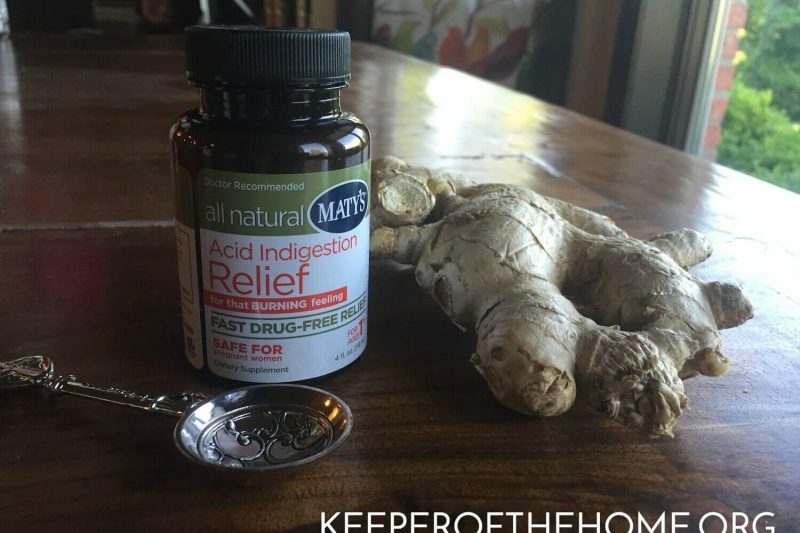 Two days later, an expectant mom and friend of mine was hanging out in my kitchen and noticed the bottle of Maty’s Acid Indigestion Relief and commented that she was always looking for something safe to use while she was pregnant because she was frequently experiencing heartburn, indigestion and acid reflux. I was happy to share with her that Maty’s is made with real, food-based ingredients. It is so safe that unlike many other products, it is safe for pregnant women. After taking a closer look at all of the information on the box and the ingredient list, my friend decided to do a taste test. She wasn’t experiencing any discomfort at the moment, but wanted to see if it was something she would even want to take. The taste passed her test and she was so pleased that I decided to taste it as well. Not bad! It totally tasted like something I would make with real ingredients. I was immediately impressed and remembered to ask hubs if the syrup had actually helped when he tried it. Apparently it had helped so much and so quickly that he had forgotten all about the discomforts. Instead of searching for something else to help, like the Prilosec, he had gone on about his day! I asked him if he would be willing to trade in his Prilosec and reminded him of all the negative side effects including liver disease, bone fractures, infections, pneumonia, breathing problems, agitation, nervousness, vomiting, unusual bleeding and bruising, breast enlargement, and constipation (or diarrhea), to name a few. People who suffer from frequent, but mild attacks of heartburn quickly reach for these PPI drugs thinking they are safe. But studies are proving otherwise. Recently, NBC News released this video: Heartburn Medicine Linked to Chronic Kidney Disease Risk stating that over 15 million Americans spent over 10 Billion dollars in 2013 for Proton Pump Inhibitors. New research has raised more red flags regarding PPI drugs commonly used for heartburn, indigestion, and acid reflux. This critical report may change the way you consider treating your symptoms. If you experience heartburn, indigestion, acid reflux or gastroesophageal reflux disease (GERD), you are familiar with Proton Pump Inhibitors (PPIs). Frequently used to treat minor symptoms, they may also be increasing your risk for chronic kidney disease. Unfortunately, PPIs have been advertised on a broad scale to consumers and heavily promoted to physicians. With this new information, red flags should be waving everywhere warning our health care industry there is trouble ahead. It shouldn’t be surprising, but it still was: my husband said he would pick Maty’s over Prilosec any day. The convenience got his attention and the taste didn’t hurt, but what really won him over was that it really worked! This product came in a liquid form, in a 4 ounce bottle. From what I’ve found, it costs around $8-9 from your neighborhood Target or Rite-Aid and $11.99 from the Matys website if, like me, you would like to forego the trip to a big store (where you’re going to probably spend $80 before you can get out of the door!). Pair that with the fact that not long after Maty’s birth and diagnosis of heart issues, Carolyn was struck with Rheumatoid Arthritis and debilitating back pain. She couldn’t move easily and was in constant pain. As a result of my research, I began creating a line of health productsthat were naturally safe and effective. Today, I am virtually pain-free. I no longer have Rheumatoid Arthritis and my daughter, Maty, is a healthy young woman. There is so much to learn about disease and the human body. I’ve learned firsthand about the mind, body, and spirit connection. Now I’m on a mission to help others heal too. My products are just one way to help you get healthy and stay that way, but I also believe we all have the power to heal. As a result of Carolyn’s research, Maty’s continues to use all natural ingredients in all of their products, which includes the Acid Indigestion Relief my hubby benefitted from, Baby Chest Rub, Baby Ointment, a Nasal Ointment to relieve nasal congestion, Cough Syrup for both children and the whole family (including a nighttime version), an Organic Cough Syrup, and a Vapor Rub. And I can’t not mention the good they’re doing with their business. In addition to helping people with these great products, they’re also supporting Vitamin Angels to help at-risk populations in need get the vitamins and minerals they need, supporting the American Heart Association’s Go Red for Women program, and donating annually to the American Diabetes Association. 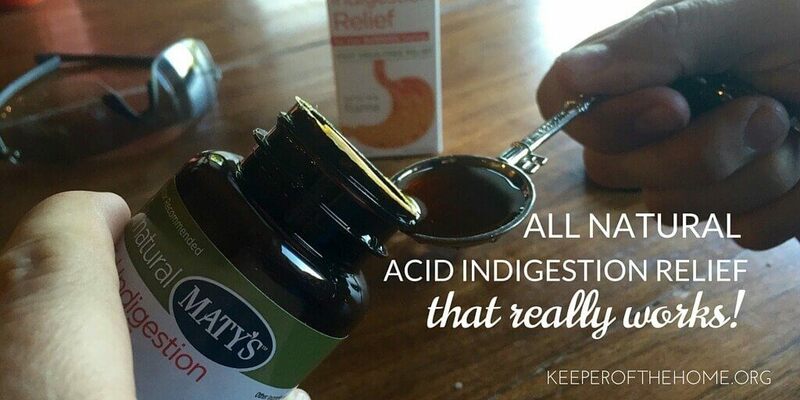 I’m happy to say that I now keep Maty’s All Natural Acid Indigestion Relief in my cabinet and look forward to trying more of their products. 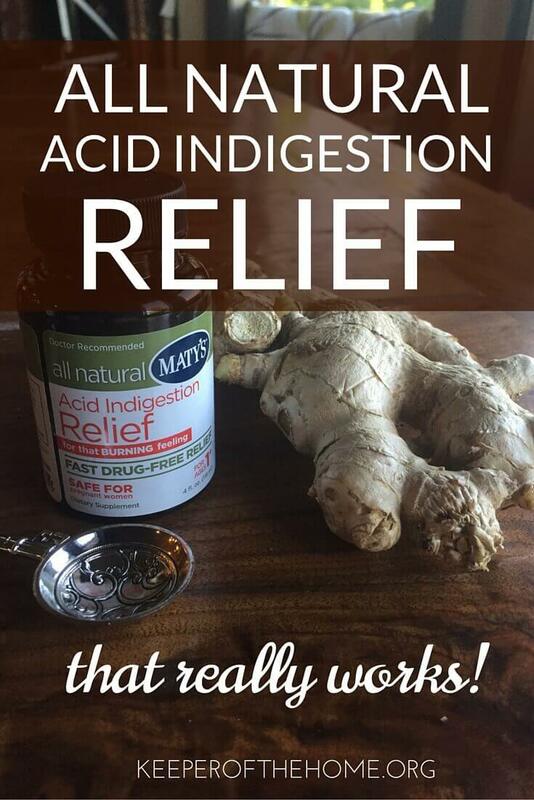 How do you find natural indigestion relief? What products or best practices have you used? Disclosure: I received free sample of the product in exchange for my honest review.